I have posted about 'Latest in Beauty' a few times, they are a beauty sample box, but unlike Boudoir Prive/Jolie Box, Glossy Box etc you don't have a monthly subscription, they cost £4.95 (delivery included in this) and they also have a smaller sample box you can try for £1.00 (you can only order one of these £1.00 boxes once every 30days). Delivery included in the £1.00 to!!!!!! For more details of the previous boxes I have had from them click here and here. So, last week (Thursday) I ordered one of their Perfume Discovery Boxes which cost me £4.95 delivered and it arrived this morning, for the price this is amazing! 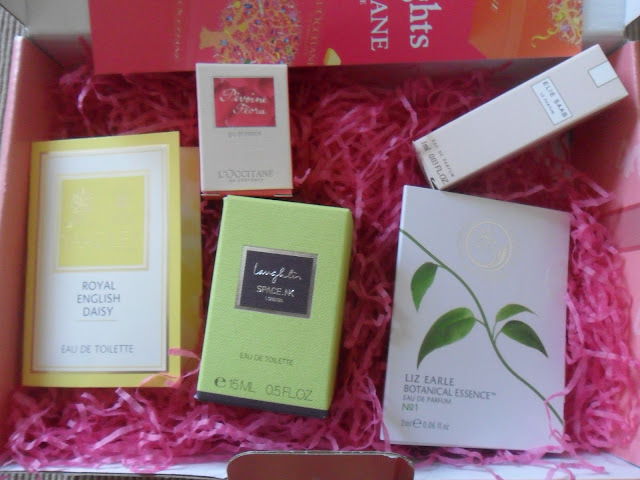 "Inside the box, you’ll find an amazing 15ml mini spray of the uplifting SpaceNK Laughter, a 5ml bottle of the sensual L’Occitane Peony, Liz Earle Botanical Essence No1 2ml spary, dubbed a new modern classic, Elie Saab La Parfum 2ml spary, citrusy orange blossom with a white floral heart and Yardley Royal English Daisy 1ml, inspired by Kate Middleton." 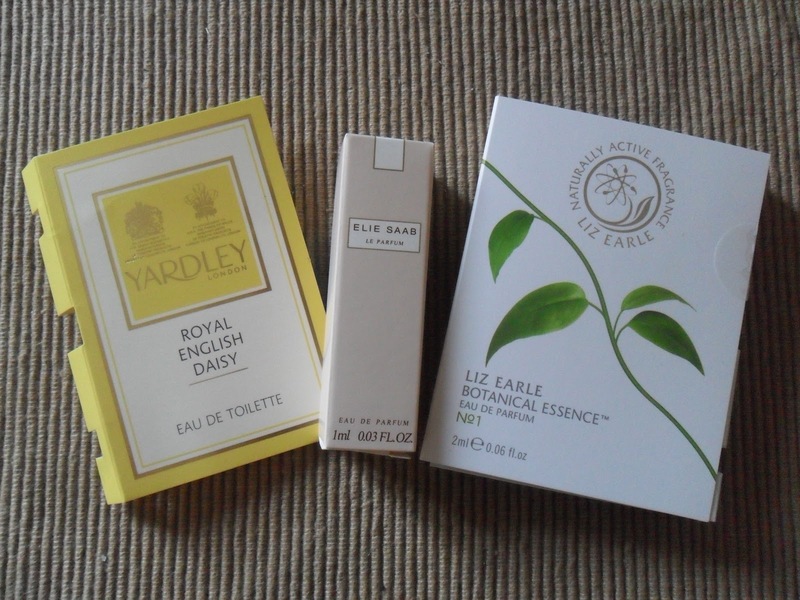 The ones I like are the L'Occitane, I would have never tested this ever and it's my fave by far, the Yardley, again I would have never noticed this perfume it has a gorgeous sweet smell, and the Elie Saab quite floraly but not overpowering at all. The other two I am not too keen on but they are nice. 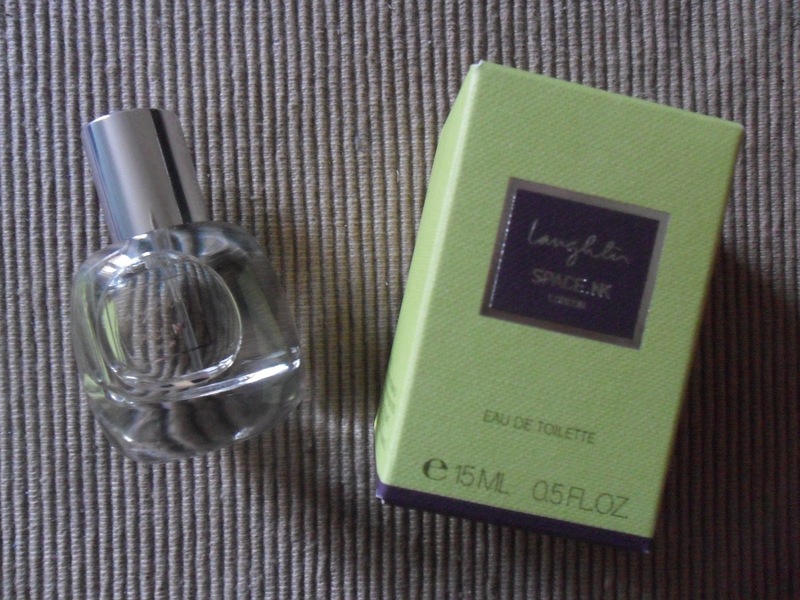 The Space NK reminds me so much of CKone, it's slightly too masculine for my liking but hopefully my boyfriend might like it :) This perfume alone sells for £18.00 for 15ml, the other i'm not keen on is the Liz Earle fragrance...why...because it reminds me of my nan! Luckily it's only a 2ml sample so I won't be annoyed with that. If you want to get your hands on one of the boxes they do click here , you do have to sign up to the website to see all of the beauty boxes and samples but this is completely free and takes 2 minutes, once you have done that the Fragrance Discovery Box is on the 2nd page of luxury samples. 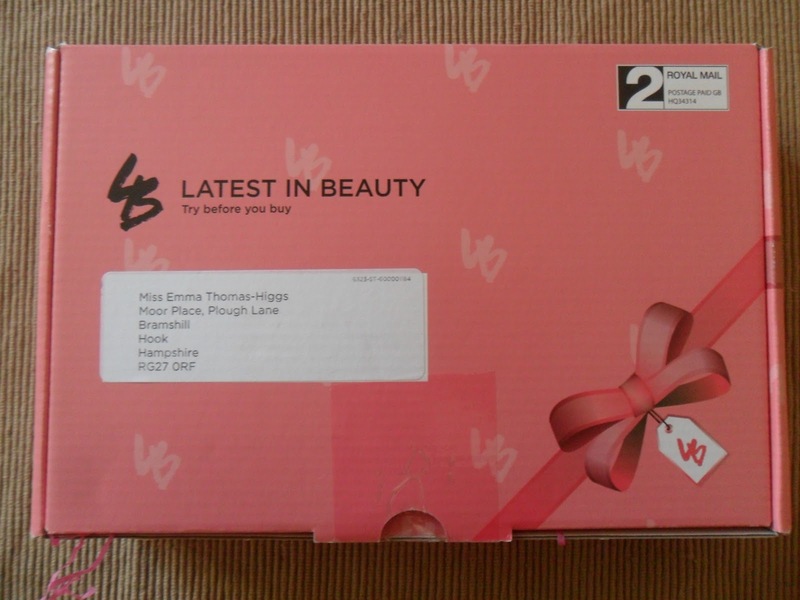 I have also just ordered my monthly sample box costing £1.00- delivered. I will show you what I get when it arrives. I love latest in beauty; I think it's fab that it goes off your phone bill an at £1 I hardly notice it! Those are some really decent samples for £5! I do too :) I'm gutted I missed out on the 'You' box, they only had 240 they cost £9.00 and were worth £90!! Including a full shade of OPI and all sorts!! ordering that box seems promising n nice since u can choose! never heard about that one before, thanks :)! @ Islay, ahh no that's a shame, they are about £4.00 each I think though so not too bad, they last ages! @ Kiwi, you definitly should, it's a bargain! @ Allie, I really thought Yardley would be abit 'old' but I was very suprised! 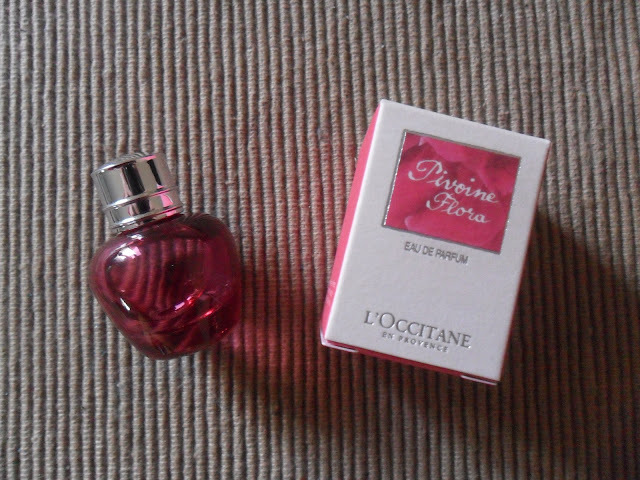 @ Jean, I think they are great for popping into your handbag, I would hate o put a full sized perfume in my bag and it get damaged! !